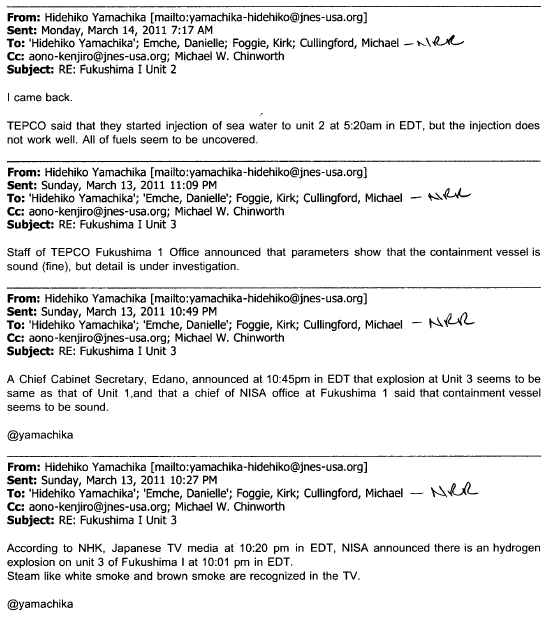 TEPCO said that they started injection of sea water to unit 2 at 5:20am in EDT, but the injection does not work well. All of fuels seem to be uncovered. Staff of TEPCO Fukushima 1 Office announced that parameters show that the containment vessel is sound (fine), but detail is under investigation. A Chief Cabinet Secretary, Edano, announced at 10:45pm in EDT that explosion at Unit 3 seems to be same as that of Unit 1,and that a chief of NISA office at Fukushima 1 said that containment vessel seems to be sound. According to NHK, Japanese TV media at 10:20 pm in EDT, NISA announced there is an hydrogen explosion on unit 3 of Fukushima I at 10:01 pm in EDT. Steam like white smoke and brown smoke are recognized in the TV.